You do not need to be a professional to know what the best chef knife would be. A low price does not determine the quality of a product as well. 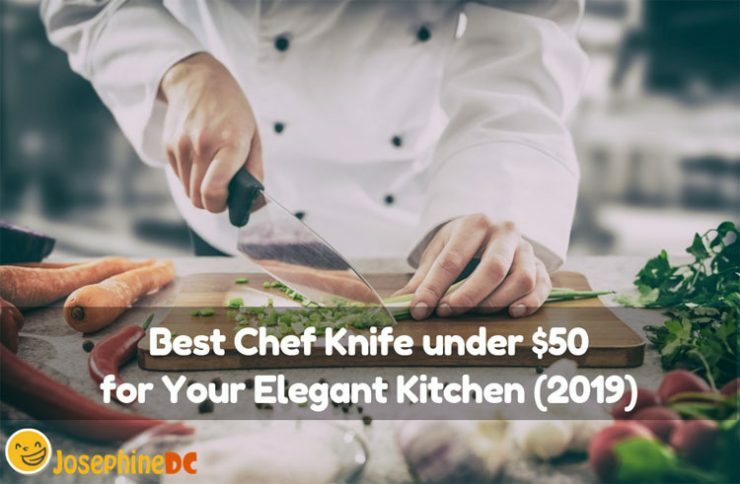 However, for the best chef knife under 50 dollars that I have in my review list, you will find yourself a knife that is not only affordable but also makes you feel like a real chef at home. A chef knife is the most useful tool in the kitchen. It can chop, mince, and dice whatever it is that you want to cook. Surely, plenty of expensive chef knives are available in the market. Why pay more when you can have it for less? You will be surprised to know that the best chef knife under 50 dollars exists! You get the best of your hard-earned money by buying the right chef knife. If you have to choose, you would probably pick the one that is comfortable in your grip, cool design, versatile, and efficient. With my list, you will get one. First, I will guide you on what to look for when buying the right choice. Chef knives could be very costly. Check it out, and some will cost you years of savings. You need to stay on focus and stick with your budget. 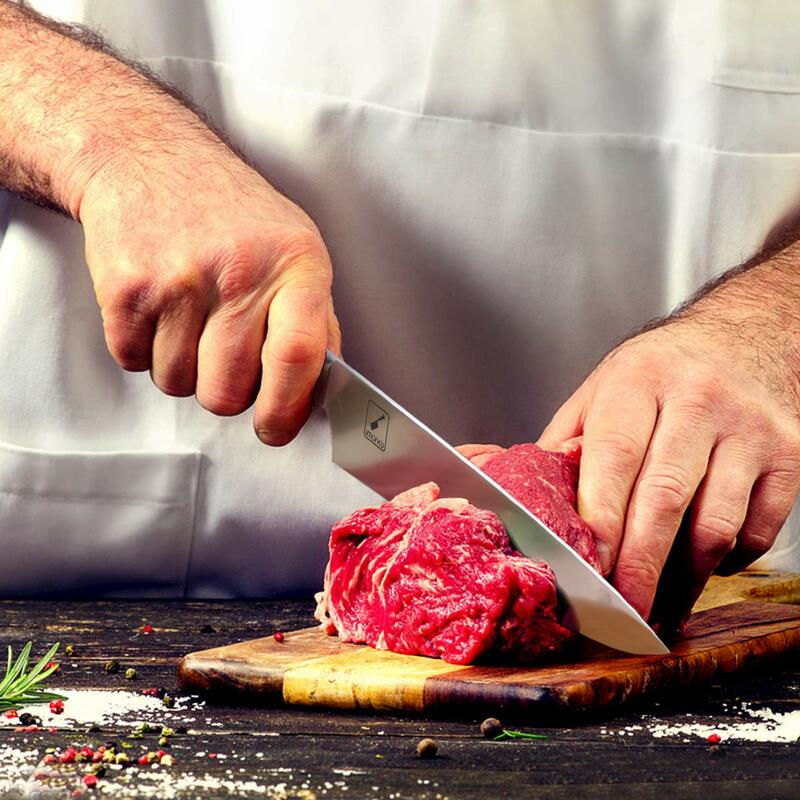 I understand that you love cooking and if there is a tool in your kitchen that you often use, the knife could be the first one that comes into your mind. Take your time and search for more alternatives. Plenty of knives that performs well are available in the market even cheaper than you can imagine. Try browsing the online shops and compare. You will be surprised to see variations of products that offer the same. However, I still find going to stores more convenient, when I can see the actual product, touch, and if lucky, try it on a cutting surface. I like it when someone can talk and guide me during the purchase. It would also be great if the store offers a testing period after which they allow you to return the product when the performance did not meet your standards. 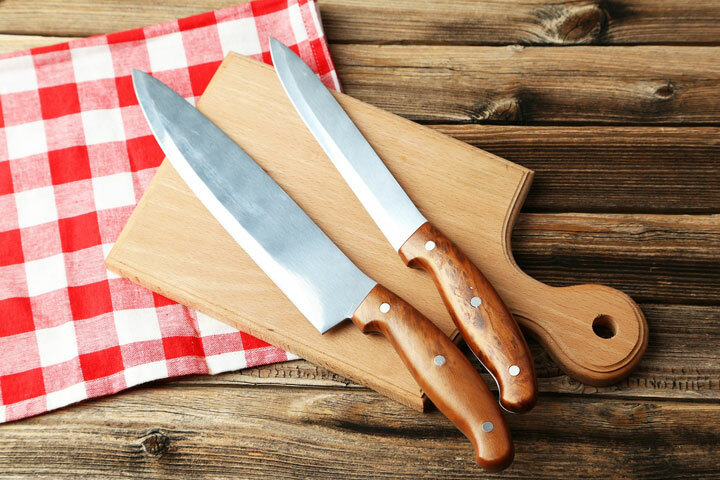 For knives, stainless steel and carbon steel are popular as high-quality materials. Often, cooks choose stainless steel because it is resistant to rust. I could say it is practical to buy since it will last a long time with little maintenance. Carbon steel, on the other hand, is vulnerable to rust, can easily chip, and needs more maintenance. However, if your priority is a knife that is sharp at best, carbon steel is what you are looking for in a chef knife. Because of this, the material is the favorite choice of chefs and other knife fanatics. They say that this type of steel makes the knife the sharpest, light, and thin that contributes to its high performance. Most of the fancy knives there is are made of combined handle materials like different types of plastics and rubbers. Usually, they are lustrous designs, robust, and sanitary. Wooden handles, however, does not imply practicality since it would decay with long exposure to water. It may look fabulous, but it harbors bacteria that may contaminate your food. Metal handles, on the other hand, have practical advantages as a composite material as plastic ones. You may find them attractive; metal handles are not safe to use when wet. With the slippery grip of the handle, it is prone to accidents. Although I admit, comfort depends on each preference. My comfort may not be like yours, and vice-versa. However, for me, I consider the size, handle, weight, and balance of the knife. I have small hands, so I choose a knife big enough for me to handle. I find the 8” knife just right for me. I also use plastic or silicone handles since they feel secure to my grip. Lastly, I find the weight and the balance of the knife vital. A lightweight knife that cuts sharp is convenient for me. Using a heavy knife strains my wrist. A well-balanced knife also adds to how comfortable and fast I perform in the kitchen. I do not like blades that are too heavy than the handle. See this video on how to know whether your knife is balanced or not. If you know how to use a chef’s knife, then you should be familiar with the anatomy of a knife by now. At least, learning how to identify the parts is a good start for all aspiring to become professionals in the art of cooking. Handle: It is a good handle when it is light and comfortable in your hand. It will also be a big advantage if it is not slippery when wet. Bolster: The purpose of the bolster is to make the knife strong and stable. It also functions as a finger guard. You may notice that some knives have partial or even no bolster at all. The advantage of having such is for you to be able to sharpen the full length of the blade. Heel: This part is the densest and widest portion of the edge so that when you need to apply force in using the knife, it will hold through. Spine: Being at the top portion of the blade and should have squared edges. Remember to feel the edges of the spine and ensure that it will not bother your grip. I do not like it when it is rough and thick. 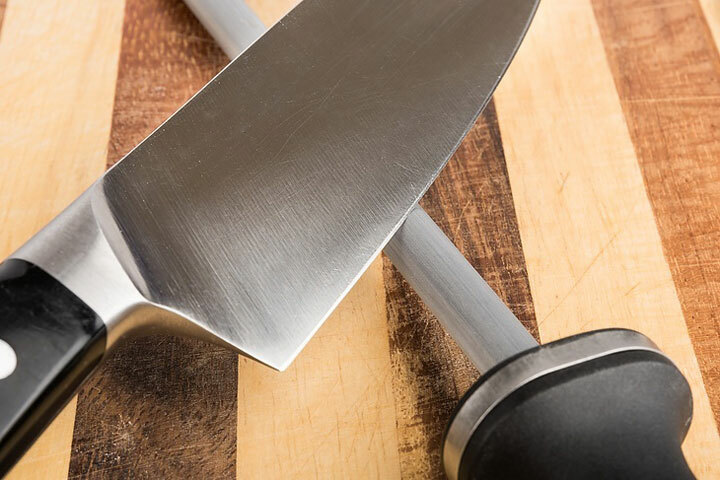 Edge: A high-quality chef’s knife should be sharp from the very first use. It is best to test it first to know. You will be amazed to discover that you can get the best chef knife under $50. That is definitely worth the savings you have and more. The products in the list are all popular among chefs, home cooks, and other pros. They all garnered the highest positive reviews and high ranks in the market. If you are a believer of German craftsmanship, Imarku’s chef/kitchen knife is crafted out of premium quality steel from Germany. A 1.4116-grade stainless steel blade is rust resistant and has excellent sharpness retention. If you are looking for convenience, the 10-inch high carbon German steel has an ergonomic handle that brings comfort to the cook’s hand. The design is perfect with the Pakkawood balanced handle for an exact and proportioned cut all the time. With its versatility and cutting performance, the chopping, dicing, and slicing with veggies, meat, pastries, fruits, and more is boundless. The smooth blade steel only requires less maintenance since it has a mirror polisher allowing you to clean easily and with the frequent use, it would retain its usual sharpness. If you pick this product, Imarku offers 100% satisfaction money-back guarantee. For me, choosing it was never a risk but a discovery. The blade is sharp but thin, so it is not suitable to cut bones. Many say that Cuisinart is sharper than a stainless steel knife. The superior-quality break-resistant blades hold true when preparing meals. However, you need to be extra careful not to drop or bang it on hard surfaces since ceramic can easily chip or break. With this advanced blade technology, this type of material retains its sharpness longer than the traditional steel that we are more familiar with. The handles have an ergonomic design as well to offer our hands perfect comfort and strength. It is made of hard plastic but is not slippery even when wet, and the knife block is made of wood. Ceramic material is also resistant to rust like any other stainless steel. Hence, you can use when cooking, cutting fruits and vegetables, and even cheese and bread. On top of all of that, the Cuisinart offers a 5-year warranty. Ceramic is fragile if hit on a hard surface. Truly, ceramics are catching up with stainless steel with knife technology. I may even say that they are equal or much better to compare with. 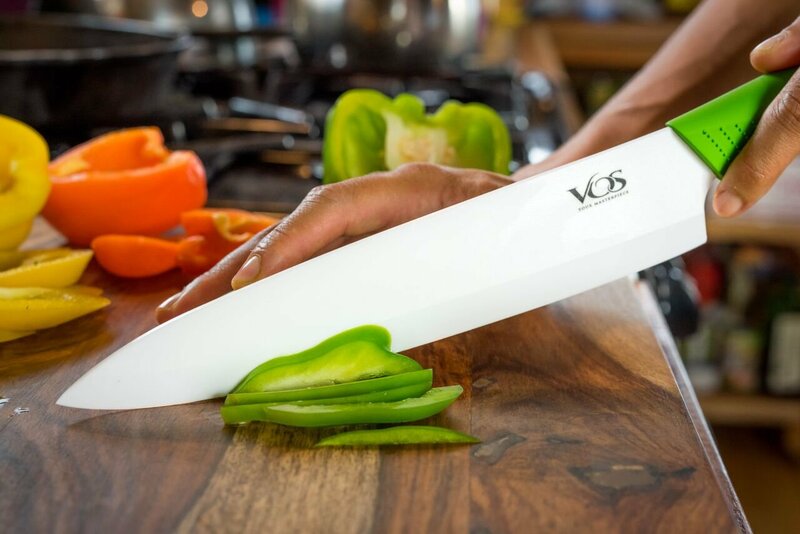 VOS ceramic chef knife comes with a sheath, box, and cookbook. The knife has Zirconia solid blades (8.5 on the scale of mineral hardness) actually comes sharp from the box and it can cut anything from cheese to meat when cooking. What every cook who bought this knife says is that it is lightweight it will not strain your wrist. Because of this, you can easily control your moves when cutting. Just like any other ceramic material, the edge stays many times longer than the traditional stainless steel. Besides, the knife has a solid plastic material for the handle, and it is rustproof, and easy to clean. You will find it assuring to know that with this buy, it offers a 30-day money back guarantee as well. You need diamond-sharpening stones to sharpen it. You cannot use for cutting bones. This time the Augymer chef knife is made of Japanese high carbon stainless steel material (SUS440A) for your kitchen’s convenience. 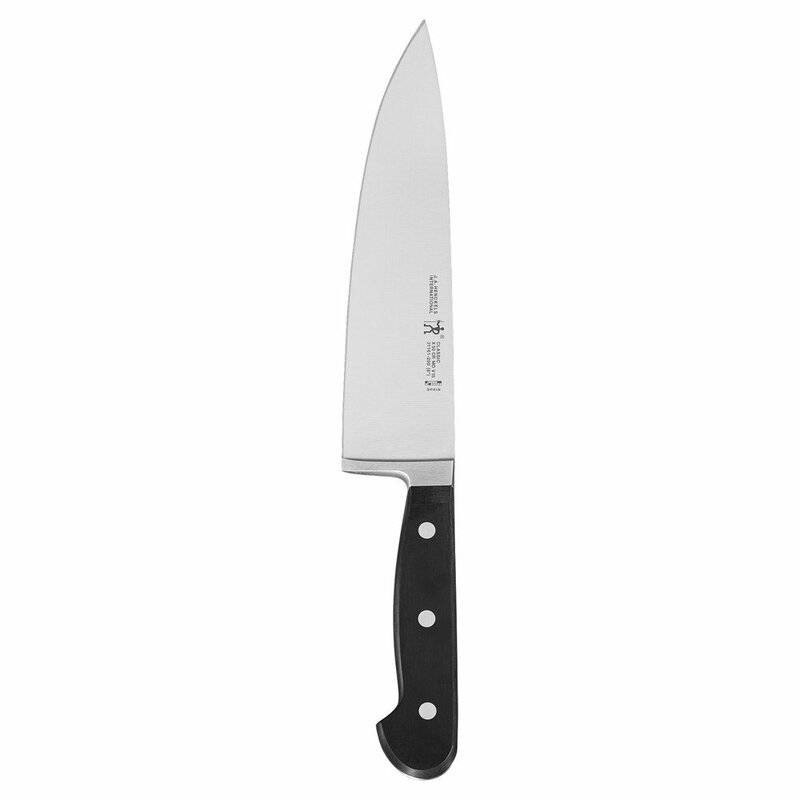 This high-quality chef knife has a good degree of sharpness and outstanding anti-rust ability. With a cutting core at 56-58 Rockwell hardness, it guarantees enhancement of the overall malleability and is very hard to break. Because of its anti-corrosion and multi-functional features, one simple wipe to clean always results like brand new. The stainless steel contains chromium that heightens the sharpness of the knife and improves the anti-rust ability. Since it classifies as multi-functional, it is suitable for professional applications or for newbie cooks as well. 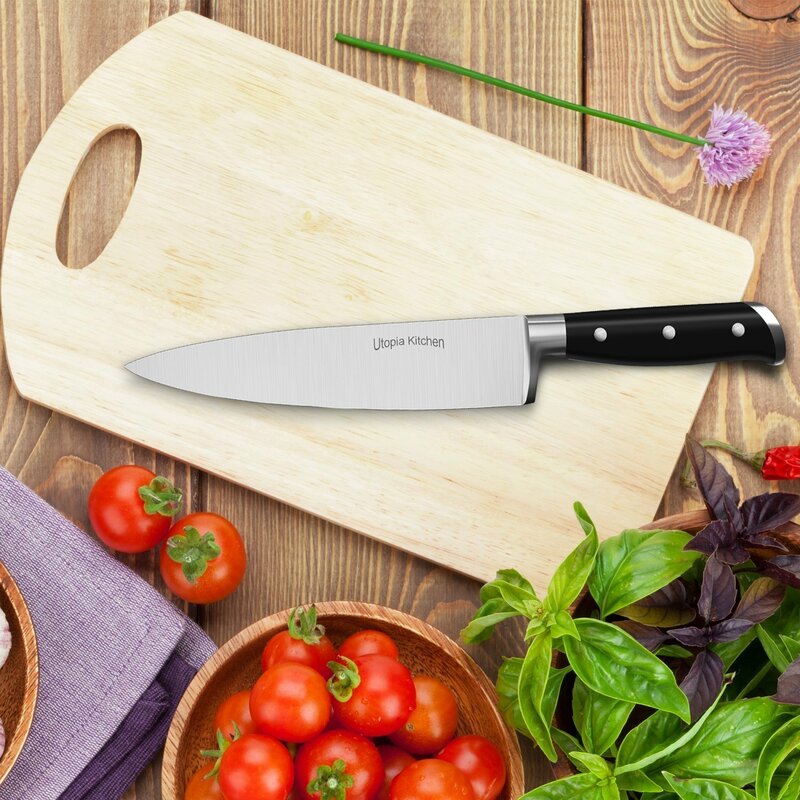 The ergonomic handle of this chef knife is made of a curved high-quality wooden handle that offers a good grip when using. It will still give comfort to your hands even after long hours of cutting, chopping, and slicing. This product comes with an elegant black box and a lifetime warranty with a 90-day no reason to refund or replace. Sharp edge does not last long but is great when sharpened. The Utopia multi-purpose chef knife is made of 100% stainless steel material which is tarnish and rust-resistant. It comes with a safe, easy to use, durable, and a high-quality blade that does not dull quickly. Its 8” sharp edge allows accuracy in segmenting food and can cut through any object of your cooking adventure. Although it is dishwasher safe, I recommend that you hand wash the product to retain the fine quality of its remarkable blade. With its ABS +430 handle ensures minimum finger cramps and aches especially during hours of use. The same handle offers you a comfortable and easy grip while working in the kitchen. Truly, it is hassle-free to use for your daily cooking. This 8” knife has a 2.5 mm thickness and has a classy and ergonomic design that allows smooth job around your cooking environment. The full tang knife has a whole length of the chef knife is 13” (8” blade and 5” handle) with a width of 1.8” and 2.5 mm blade thickness. At last, we have come to a chef knife from Spain but has a material fabricated from high-quality German stainless steel. Its fully forged construction offers sturdiness (62 Rockwell) and a smooth transition from blade to handle. This ergonomic polymer handle is traditional, a triple-rivet design that offers balance and a shade heavier than any other lines. It gives comfort to your hand during the cutting, slicing, and chopping for hours. The professional satin-finished blade shows precision cutting and fine polish for lasting sharpness. Although this chef knife classifies as dishwasher safe, still, I recommend washing it manually to maintain the sharp edge of the blade. The 8” chef knife may come from Spain manufacturer, but the blade material is from Germany. This Spanish-style product is multipurpose, practical, and with constant sharpening, keeps the blade sharp. The straight edge chef knife has an 8” blade (20-22 deg.) a 5” handle and is 13” total length. 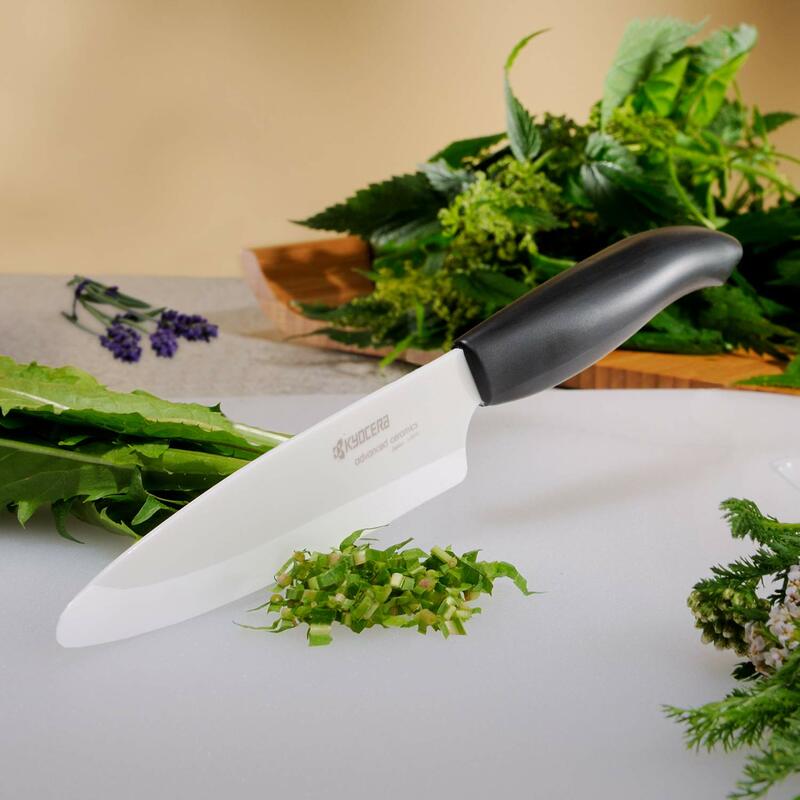 Kyocera’s Ceramic blade 7” Professional Chef Knife is made of proprietary zirconia material from Japan with excellent quality and exquisiteness. The ultra-sharp and pure advanced ceramic blade maintain the edge 10x longer than stainless steel material. Because it is lightweight and easy to clean, the blades will not brown food. It is utterly rustproof and resilient to acid. The product is suitable for larger slicing tasks from veggies to boneless meat. Take note that you should not use this on hard or frozen food. Designed for home and professional meal preparation, the knife has a comfortable grip leaving your wrist and hand free from exhaustion. This knife is dishwasher safe but make sure to place it on a metal rack away from other metal utensils. Have you finally chosen your best chef knife under $50? 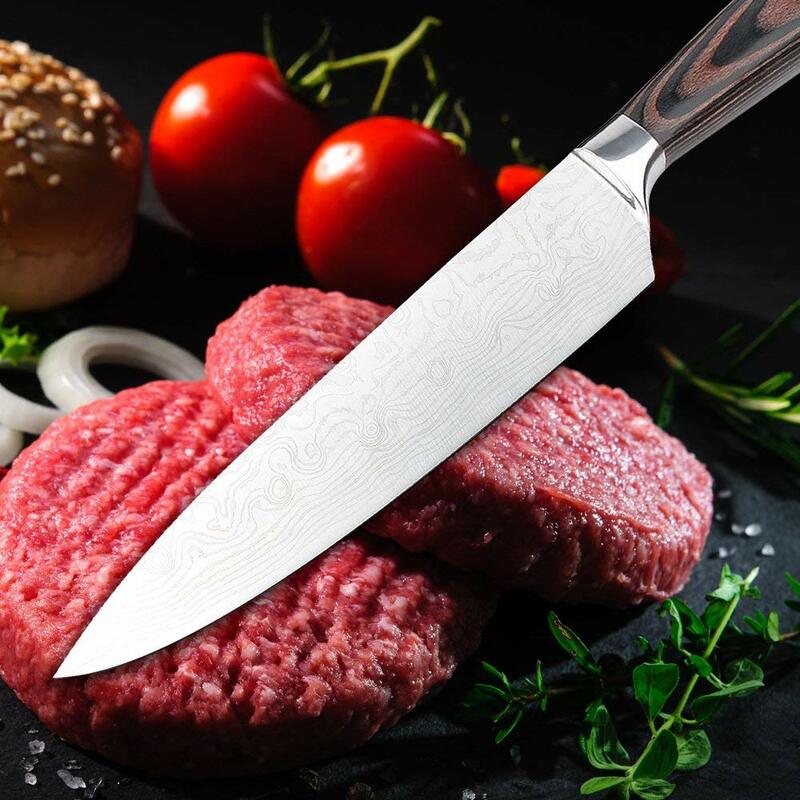 Know that whether the knife blade is of stainless steel or ceramic, as long as it is of excellent manufacturing and the material is of high quality, it will turn out to be a perfect chef knife for home and for business. All the knives that you find in my list excel any standard product you will find in the market. With your kitchen expertise and the performance of each, the result will be a superb meal preparation that would exceed anyone’s expectation. Good luck in finding the right choice for you!